There are limited data regarding the role of second-line treatment for metastatic pancreatic cancer (mPC) after the failure of initial chemotherapy. No data exist on the use of GTX after the failure of first-line therapy. We identified patients who were given GTX chemotherapy for a diagnosis of mPC after the failure of initial therapy. 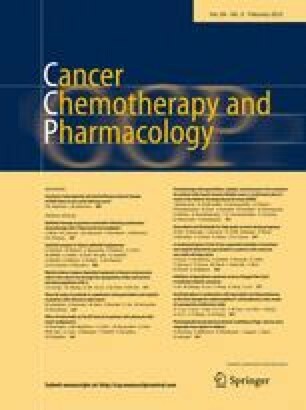 Demographic features, progression-free (PFS) and overall survival (OS), response to treatment, and toxicities were recorded. The 59 evaluable patients received a median of 2 prior therapies. Three had no prior gemcitabine. Median PS was 1. Median survival was 22 weeks; progression-free survival was 9.9 weeks. Survival did not correlate with the number of prior regimens but trended with PS. There were no radiologic responses; those with stable disease (n = 21) had a better survival than those with progression (n = 29) or unevaluable patients (n = 9). Median survival was 38.3, 15.0, and 7.4 weeks, respectively. Grade 3 and 4 toxicities included leucopenia (n = 14), anemia (n = 7), and thrombocytopenia (n = 6). Hospitalizations were required in 21 patients, for febrile neutropenia (n = 7), non-neutropenic infection (n = 3), pulmonary embolus (n = 2), anemia or failure to thrive (n = 9). A 75% drop or more in CA 19-9 correlated with improved survival. GTX is an active regimen in patients previously treated with gemcitabine for mPC. Better performance status and >75% drop in pretreatment CA 19-9 were associated with longer survival. The number of prior regimens did not predict for survival duration. Presented in part at the 2010 ASCO GI Meeting, Orlando, FL, January 2010. This research is supported in part by the National Institutes of Health through MD Anderson’s Cancer Center Support Grant CA016672. Dr. Wolff received the Research Funding from Eli Lilly.